What was behind the "unofficial" referendum on Venetian independence? Why was it so popular? And could we soon be saying arrivederci to Veneto? Demotix/Antonio Melita. Some rights reserved. The independence referendum held in Veneto between the 16 and 21 of March adds to a growing list of struggles for territorial autonomy within established nation states and advanced democracies in Europe. As is well known, this year Scotland will go to the polls to decide whether it becomes an independent country. Crimea has also recently made the headlines for its sudden desire to secede from Ukraine and re-join Russia – a decision supported by a landslide victory in a recent, if contested, popular referendum. And yet, in many respects, the Veneto independence referendum cannot be directly compared to these cases. In the first place, the referendum was unconstitutional and defective. According to the Italian Constitution (Article 5) “the Italian Republic is one and indivisible” – which, put simply, means that no referendum could ever be lawfully called to question or change this principle. Another issue concerns the way in which the political group Veneto Indipendente managed and organised the referendary ballot, mainly through the web platform plebiscito.eu. Unlike other cases in Europe, in fact, the result was not legitimate because the vote followed unconventional rules – i.e. people could cast their vote online, via telephone or at polling stations improvised in town squares across the region. Hence, when the organising committee declared with enthusiasm that the referendum was won with an overwhelming majority (89%, with nearly 2,5 million votes cast), many politicians and commentators hurriedly shelved the issue, arguing that the vote was only hypothetical and not verifiable, and therefore null. Moreover, the political movement behind the referendum is neither a strong nor a coherent political force. Veneto Indipendente (and the so-called ‘Venetists’) brings together a number of small and fractious autonomist groups and ‘leagues’, which over the years have never managed to coordinate their forces to create a credible agenda or gain any real political clout. As a consequence, the Venetists and their claims have never been taken seriously by the Italian political class. In spite of these flaws, there are several reasons that explain why the Veneto Independence referendum should not be discarded as a trivial matter. First and foremost, the vote reflects the presence of widespread feelings of malaise and dissatisfaction in the region, which were successfully channelled by Veneto Indipendente. This is confirmed by the findings of a survey conducted on the 20 and 21 of March by the Italian Research Centre Demos&Pi, and published by the political analyst Ilvo Diamanti in the daily La Repubblica. 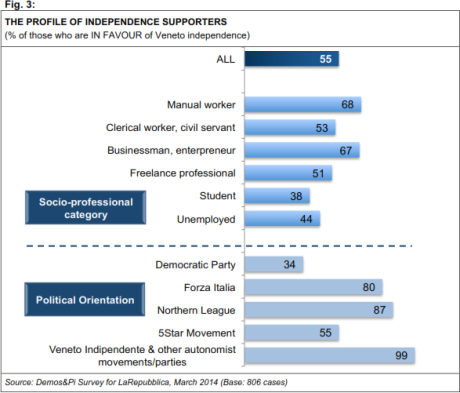 The research draws on a representative sample of the electorate of the Veneto Region. The results show a downsized and yet very significant picture of the referendum outcomes. 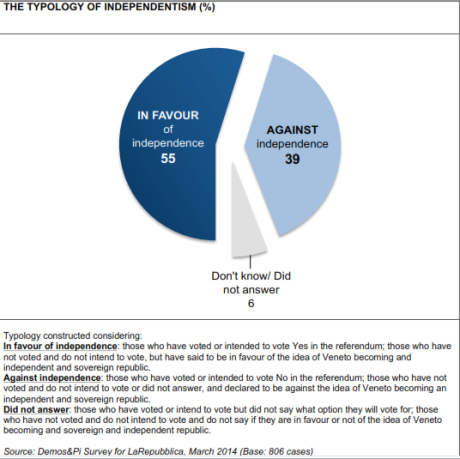 Interestingly, nearly half of the Veneto electorate claim to have voted or to intend to vote in the referendum, and 78% of them are in favour of the referendum question (i.e. “Veneto should be an independent and sovereign republic”). This view is also shared by one third of those who said they did not intend to vote. 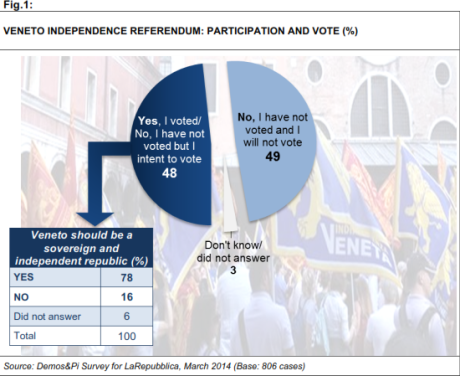 Overall, the majority (55%) of the electors included in the sample are in favour of Veneto becoming an independent and sovereign republic, whilst 39% are against this option. This is very important data, which shows the presence of a wide (although maybe not purely plebiscitarian) support towards independence across the region. In addition, the results of the survey help to understand the social profile of those who favour the independence option. The bulk of support comes from businessmen, entrepreneurs and manual workers – who represent the traditional social fabric of the region. On the other hand, the idea of a sovereign republic of Veneto is less popular among the younger generations and students. This seems to suggest that independence is endorsed in particular by the ‘older generations’, i.e. by those who have worked hard to make the region prosper, and are now hit hard by the economic crisis and the austerity measures of the central government. From this angle, they perceive independence as a way of changing the state of things – taking ownership of Veneto and its future from the bottom, bypassing Roma ladrona (‘Rome the thief’ is a popular slogan of the Northern League). Furthermore, it is interesting that independentist views are particularly popular among right-wing voters in the region (i.e. Forza Italia, 80%; the Northern League, 87%; and of course other autonomist parties/movements, 99%) as well as among supporters of Beppe Grillo’s 5 Star Movement (55%). Politically, Veneto has long been a centre-right stronghold – although recently the 5 Star Movement has attracted a growing number of votes in the region, signalling a mounting sense of disengagement towards mainstream party-politics in general and the Northern League in particular. Unsurprisingly, only a minority (34%) of supporters of the centre-left and the Democratic Party (that is leading the current coalition government) are in favour of independence. So what emerges from the findings of this research is an image of Veneto as a region with a growing sense of detachment towards the institutions of the Italian State, and its political system. These anti-politics feelings provide fertile ground for a form of secessionist populism of a regional nature, which has been effectively exploited by the Venetists. In exploring the nature and the reasons for the success of independentism in Veneto, it is therefore essential to understand the roots of this anti-politics and populist drift, and its potential consequences. Firstly, the Veneto independence movement is not based on any overtly ethnic claim. Although some references are made, for example, to the use and promotion of the regional language, cultural heritage is not seen as the primary issue at stake in the quest for independence. Instead, the predominant cleavage in the narrative of the Venetists is of an explicitly economic nature. In this sense, the distinctive values of the region are not purely cultural, but they refer to hard work and productivity – traits of which the Veneto population is particularly proud, and that are key in defining its territorial identity. In fact, Veneto is one of the wealthiest and most productive regions in Italy – which contributes considerably towards the national GDP, and that as a consequence, contributes more taxes to the national coffer than other areas. These, however, are then redistributed across the country, so as to support the regions lagging behind (e.g. the southern areas). Such a trend is not new, but in the context of the recent economic crisis and the subsequent austerity measures, most of the small and medium enterprises in Veneto feel that the Italian State has tightened its stranglehold on them, and that they give much more than they receive. In the wake of these feelings, taxation (and a resolution to achieve total fiscal exemption) has been the leitmotif of the Venetists’ campaign. Centre-right political parties had previously taken this case on board, promoting measures of fiscal decentralisation that intended to relieve the burden placed on Veneto (and other productive regions in the north of Italy). In particular, in the past few decades, much of the success of the Northern League (NL) drew on its political claims for fiscal devolution, which gained the party votes in regions such as Veneto and Lombardy. Its experience in government with Berlusconi’s People of Freedom aimed at ‘bringing to Rome the issues of the North’, and the creation of a system of fiscal federalism was the flagship policy of the Northern League’s agenda. However, once in public office, the party did not go far in this plan – showing its inability to contribute to change and influence the centre in the interest of the North. Besides, throughout the years, some of the NL’s key figures, including its founding father and former leader Umberto Bossi, were involved in cases of political corruption – much to the detriment of the party’s image as an alternative to the mainstream politics of the centre. These factors played a role in creating a critical gap between the party and its electorate, based on a feeling that neither the NL nor the centre-right are capable of delivering, leaving the needs of Veneto unanswered. This was clearly reflected in the results of the 2013 general election, in which the NL managed to get only a fistful of votes, with considerable losses in its strongholds (i.e.gaining a mere 10.5%, with a loss of -16.6%, in Veneto). Tellingly, the rising star of the Northern League and governor of the Veneto region Luca Zaia, with his unfailing flair for the pulse of the region, has promptly endorsed from outside the case of independence, possibly in view of the next election when he may jump off the derailing wagon of the NL, and create his own civic list. The recent success of the independence movements in Veneto grafts precisely onto this crisis of the Northern League, combined with a widespread perception that the region has been exploited and ignored by the centre for way too long. Hence, it can be argued that the Venetists have successfully filled the political void created by the decline of the party – and the independence referendum has provided a means to voice the discontent of the citizens of Veneto that had previously been mobilised by the Northern League. This suggests that, no matter how inflated or unverifiable, the results of the independence referendum in Veneto should be taken very seriously – because they provide a clear picture of the state of exasperation in local society. For the population of Veneto, independence claims constitute a way of exposing and denouncing, in an extreme way, their disquiet with the central State, and their dissatisfaction with the political class and the government both at national and regional level. These feelings might be particularly pronounced in Veneto but, as the results of the 2013 general election clearly demonstrated, they are echoed also across the whole country. Therefore, the main political parties and the government should not discard the independence referendum as a farce. The Venetists are already joining forces with other regions (e.g. 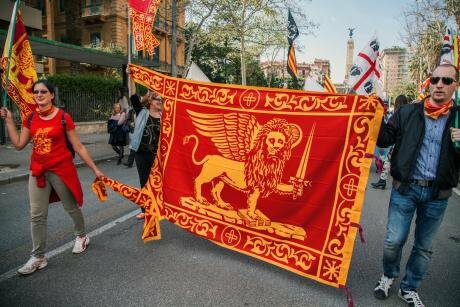 Sicily and Sardinia) to promote the organisation of other independence referenda – with a potential to fuel further centrifugal and autonomist claims across the country. Waving the flag of independence does not necessarily mean that Veneto wants to (or will) secede from Italy in the near future. 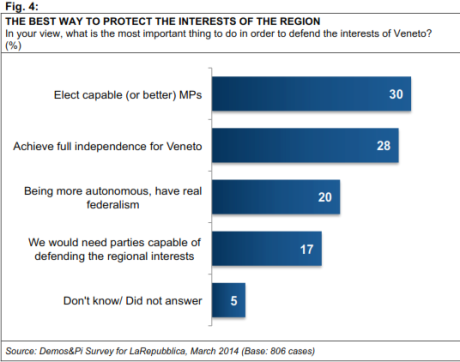 As Demos&Pi’s research shows (see figure 4) what the people of Veneto really want is a more efficient political class, capable of tackling the most pressing issues that affect the region. Hence, the independence referendum should be understood as a ‘cry for attention’ on the part of the people of Veneto, which is directed towards the wider Italian political system and institutions. What remains to be seen is whether the Italian parties will prove capable, this time, of undertaking this challenge in an effective way, before events escalate. A clear example of the risks at stake is provided by a recent plan developed by an extremist wing of the Venetists, and thwarted by the Italian police on the 2nd of April, to deploy an armoured vehicle in San Marco Square in Venice on the eve of the European elections in May. From this angle, the EU vote will certainly be a measure of the magnitude of anti-politics sentiments not only in Veneto but in the whole country – and also an important test (or wake up call) for the Italian political class.